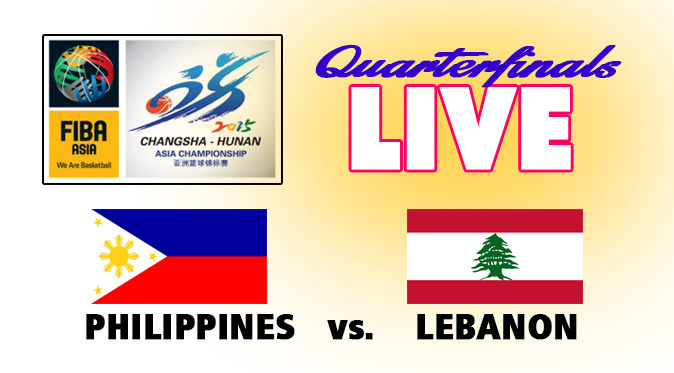 Watch the live stream of Gilas Pilipinas vs Lebanon in the Quarterfinals of the 2015 FIBA Asia Championships on Thursday, October 1, here. The Philippines' national mens basketball team is one step closer to capturing this year's title, but the Lebanese squad composed of young and veteran players stands in their way and is not easy to beat. With players such as Andray Blatch and Terrence Romeo taking care of scoring, Gilas Pilipinas has become a heavy favorite heading into the knockout stage of the tournament held at the Changsha Social Work College gymnasium in Changsha, Hunan in China. The Filipinos should never get over confident though as Lebanon, with its stars player Amir Saoud and Fadi El Khatib leading the offense, might pull an upset and hand over to them a heartbreaking loss. But of course, coach Tab Baldwin and the rest of the team are expected to work harder and execute their plays the best they can in order to secure a spot in the semis where they will meet the winner of the Qatar vs Japan match today.